Allegro Medical offers a wide variety of gauze dressing and packing strips at wholesale prices. 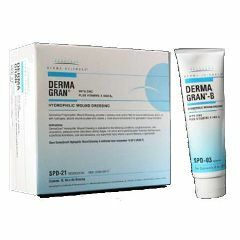 Whether you are looking to treat bed sores, dermal ulcers, symptoms related diabetes, or other skin conditions you are sure to find the wound dressing products and supplies you are looking for from names you can trust. Browse our inventory of top wound care products from trusted brands such as Cardinal Health, Curad, Invacare, McKesson, Kendall, Xeroform and many more. AllegroMedical.com offers only the highest quality wound care products and accessories at the lowest prices guaranteed. See our Best Price Guarantee for more details. XEROFORM Petrolatum Gauze 5 x 9"
XEROFORM Petrolatum Gauze 4 x 4"
XEROFORM Occlusive Petrolatum Gauze Patch 1 x 8"